Following on from the last post, we continue to look at the site on the south-western corner of Queen St and Creek St where the first Brisbane School of Arts stood. The site was purchased for £8,000 by the Queensland National Bank in 1872. The bank was operating out of leased premises where it stayed while the plans for the construction of its new head office to be built on the site were developed. It appears that this process was somewhat convoluted. The Queensland Cultural Heritage web pages report that the bank initially wanted Mr FDG Stanley to design the bank. Stanley, the Colonial Architect at the time, was about to resign from this post to take up private practice, but there was some delay and so the bank contracted Messrs Reed and Barnes from Melbourne for the job. After they had completed their plans, the bank found that Stanley had become available, and Reed and Barnes were paid off without having to release their plans to the bank. Stanley then designed the building, which was built by Southall and Tracey for £33,997, and the bank was completed in August 1885. It is pictured below. The State Government's Heritage site describes the building thus: "The former Queensland National Bank building is a three-storeyed brick structure with sandstone facings, built in the Classical Revival style which was common in bank architecture of the period. The building has a distinct Palladian influence with careful classical detailing and giant order columns. It is built on a corner, and the two facades are dominated by bays of Corinthian columns which rise through the upper two storeys." The building was constructed from local sandstone together with limestone imported from New Zealand, and local cedar. 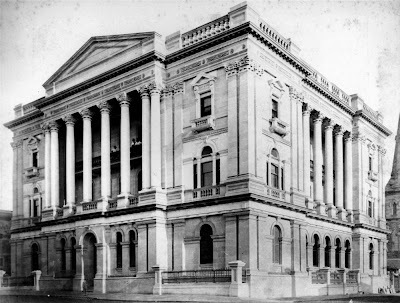 The Queensland National Bank became the National Australia Bank, which still owns the building - a recent photograph is shown below. That the building survived the frantic "redevelopment" surge of the seventies is due to the commitment of the owners, and as a result, the National Australia Bank received an award from the National Trust of Queensland in 1976. There was considerable restoration of the building in 1981, and ongoing minor work has enabled the building to continue its role as one of the city's landmarks. It even features prominently in a current television advertisement for Allen's sweets - you can see a YouTube video here. The Queensland Heritage site says: "The pediment which originally surmounted the Queen Street facade was replaced by a brick and concrete oblong in 1915." It doesn't say why. I prefer the original look also. Do you have a photo of the Commercial Banking Company of Sydney (CBC Bank) on the opposite corner to the NAB (above photo). My father retired from the CBC in 1966 and I would like a photo possibly of that vintage, if not, a current shot of the building, if it still stands.